Holy Cow, this week went fast! Happy Friends with Flair, everyone! It's Spring Break here, which is the earliest spring break of anyone I know. The last couple of years we have driven to California and had tons of fun, but by the time we got back I needed a vacation from my vacation. This year we stayed home and it was so nice not to drive anywhere. My little guy's school is on the opposite side of town, so every day he has school I lose an hour of crafting time. Grrr. This week's card is inspired by the colors my sister chose for her nursery. I've been recovering a rocker that's been in our family forever for her with those fabrics. I finished and I'm glad I'm done, because fabric moves around too much. Paper is much easier to work with! This has to be one of the lightest cards I've ever made! Love this, Sarah! I'm totally case'ing the sketch! Beautiful! I love your bow! lovely simple card...love the banners. This card is so pretty. Great take on the inspiration. Love the design and that bow! 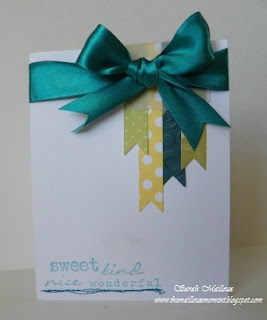 Adorable card, love those colors and banner strips hanging down! 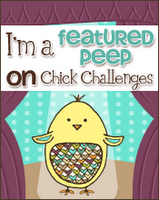 i like this card... i think i need to make a few of these!!! Oh, I just love the colors too...and the banners are so cute. Simple, light, and wonderful! YAY. Have fun on the rest of your Spring Break! simple and clean and pretty. This card is so sweet. I love it. Ah! Love this CAS card! Great design! I love this design with those strips ofpaper coming down...fabulous CAS. Wow, Sarah, the ribbon, the colors, the design are all so fantastic!! I LOVE your card. 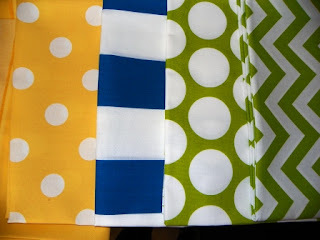 Fab fabric, too (I can see why you were inspired!). You asked a question on my blog about the pinwheels (sorry to just now be responding--I've been out of town all week). There are two ways to make the pinwheels move: 1) Make the hole for the brad a little larger than needed for the brad, or 2) Punch a grommet first, and then put the brad through the grommmet. #2 is probably the most common way, but if you're in a pinch or don't want to go through the extra time for a grommet, the first way has worked for me. Just be sure to add a little drop of super glue after you wrap the brad around the back. If you have any questions, you can e-mail me at redballooncards (at) yahoo (dot) com. Oh this is fabulous!!! Love, love, love the design!! !